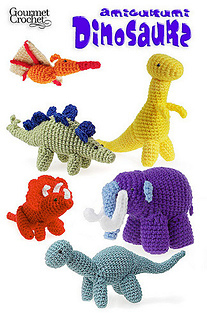 These fun and colorful dinosaurs take your crochet for a walk on the wild side! Brontosaurus, T-rex, stegosaurus, triceratops and wooly mammoth, all made with colorful worsted-weight acrylic yarn. All animals are made with size G hook and worsted-weight yarn, and are stuffed with polyester fiberfill.